khagendra sangraula | United We Blog! The Indian blockade of Nepal (#IndiaBlockadesNepal) has been running for over three months now. Being landlocked, most of Nepal’s imports come via India. Although international laws provide landlocked countries the right to unrestricted passage to the sea, India has been unquestioned by the international community on the way it is putting an entire country of about 28 million in “ventilator support”, in the words of senior Indian journalist Anil Yadav. The blockade has created a humanitarian crisis, apart from economic and political ones. By blockading Nepal, India is supporting a group of protesters in Central Terai of Nepal. The blockade has caused massive suffering to people all over the country. Economy has been destroyed and might take years to recover. Jobs have been lost, investors have pulled out, major infrastructure and development projects have been badly affected and put out-of-schedule, and education of millions of kids has been disrupted. Industries have closed because of lack of security and raw material supply. Vaccination programs have also been disrupted. This shows the scale of suffering Nepal is facing because of the inhumane blockade by India. The Modi government, together with Indian bureaucrats, diplomats, and intelligence officers have especially taken a harsh position, advocating that India should continue to pressurize Nepal this way. Below, we present a selection of pictures and tweets to illustrate some of the hardships Nepali people have been put through by the blockade on Nepal by its big southern neighbor India. Amit Yadav, a kid from Eastern Terai, died because he could not visit a hospital for monthly checkup. Amit happens to be Madhesi-origin. Transportation has halted, especially in Eastern Terai but also elsewhere because of the blockade by India and the protests in some parts of Nepal that it has strengthened. UNICEF has reported than millions of kids are in grave danger of death, disease and malnutrition because of the blockade by India. The protesters have burnt several ambulances. The pictures in the tweet above show two vandalized ambulance. The first one was carrying a kid in critical condition, who died because of the protesters. Several earthquake victims have died this week due to cold. Earthquake victims cannot buy food, fuel, and construction material to build shelters because of the blockade. They are having to sleep outside. A harsh winter in the hills is worsening their condition. Nepal suffered two big earthquakes earlier this year, before India blockaded imports, making it almost impossible for relief to reach earthquake victims. Humanitarian organizations cannot operate under such lack of essentials. Lack of fuel to eat and heat is making lives harder for elderly people. This woman is carrying cooking gas after a long wait. Indian blockade has made essential supplies harder to get. A 85-year old man walked for hours and waited on a long queue to get some firewood. Because of the shortage of fuel, the government sold limited quantity of firewood by cutting forests. Several patients are dying because of lack of essential medicines and supplies. Hospitals cannot operate properly due to the blockade. Many hospitals are operating under capacity and have stopped surgeries because of lack of supplies and essentials. In rural areas, simple medicines are also unavailable. The following picture shows food being prepared for patients using firewood in one of the largest hospitals of Kathmandu. The following picture shows people queuing up for medicines. Kids are collecting essentials for their families. In the following picture, they are carrying firewood as fuel has become scarce. The blockade has strengthened and supported a violent protest going on in the Terai region of Nepal. Protesters attack journalists, police and ordinary citizens with Molotov Cocktails. Even Indian police has entered Nepali territory and fired at Nepali citizens and police. A Madhesi lawmaker was attacked by the protesters. Several other political parties and people with differing opinion are regularly threatened and attacked in the protest areas. Protesters have almost banned political activities and campaigns by other parties. The President of Nepal was also humiliated and attacked by protesters. Ordinary Madhesi are also suffering because of the Indian blockade that has strengthened a violent protest in the Terai region. In the first picture below, the protesters burnt a moterbike, along with its owner Dilip Chaudhary. The second picture shows Bablu Rajbanshi burnt by the protesters. Trucks, including those carrying medicines, are burnt by the protesters. The blockade has strengthened the violent protests, which has invited state police to safeguard highways and public property. Protest organizers have publicly provoked and called for violence and use of weapons. In retaliation, police action has sometimes been brutal and in violation of human rights. Several protesters and onlookers have been killed by police action. On the other hand, several police personnel and civilians have been attacked, lynched and killed by the protesters. 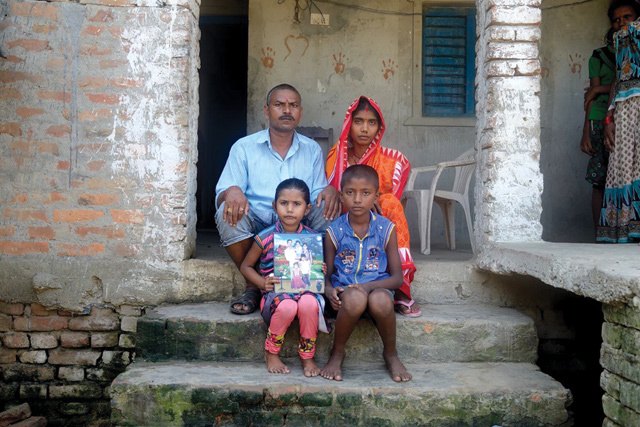 The picture below shows a Madhesi family holding a picture of their dead son. Indian border police beat up Nepali police personnel and confiscate pistol. In the following pictures, this side of the gate is Nepal and the other side is India. Stones are being pelted on Nepal police personnel from the Indian side of the border. In the first picture, Indian security personnel are standing guard at the border, providing security to the attackers. People are now cooking on firewood for months. Nepal has been pushed back to pre-industrial era by the Indian blockade. 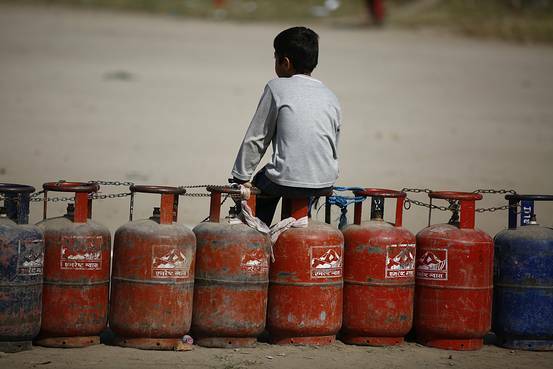 There’s acute shortage of cooking gas and food supplies. Restaurants have modified their menu because of the blockade. Only limited items not requiring a lot of fuel are on offer in restaurants. Many are cooking on firewood. Several businesses have closed permanently, leaving many jobless during festival season and the ensuing winter. Protesters emboldened by the Indian blockade regularly destroy buses plying in the Eastern Terai, in a gross violation of human rights. Almost all buses traveling there have damaged windows and windscreen. Many people have been injured and killed during the violence meted out against innocent travelers on highways. Buses often travel without any windscreen, making it extremely chilly and uncomfortable inside. Travel is possible only at night, and every night passengers are greeted with stones, Molotov cocktails and other objects thrown at them. People sleeping on the road for days, waiting their turn to get supplies of cooking gas. In this picture, an international cricketer of Nepal is seen at the arrival lounge of Nepal’s airport with an electric induction stove. He bought it while on a trip overseas. Those who can afford have switched to such electric heaters because cooking gas is no more available in the market. Indians are not at risk in Nepal. Nepalis have remained calm throughout the blockade and been sensible to separate the ordinary Indian people from their brutal and bully government. But while previous generations faced several Indian blockades and harbored a generally hostile attitude towards Indian intentions in Nepal, the newer generations were more open and cosmopolitan in nature. Now that they have witnessed the Indian aggression at a very difficult time in their country’s history, the sense of optimism has suffered a great setback. People are very discouraged and this will reflect directly in the coming generations’ view of their big neighbor to the South. There have been several spontaneous protests and social media campaigns against the blockade both in Nepal and in the cities of Europe or USA with large Nepali diaspora. Modi more destructive than the earthquake? The blockade has put to display Nepal’s own ugly sides. Nepal’s politics is messy, like in many similar countries. Here are some examples. A professor defends the burning of ambulances and death of kids because of protesters blocking ambulances as needing to be seen “in a context”. This is very much reminiscent of how the violence unleashed by Maoist rebels during their insurgency was defended by its apologists. Former Prime Minister and Maoist politician Baburam Bhattarai leads a group of so-called “civil society leaders”, which includes Dr Devendra Raj Pandey, CK Lal, Krishna Hachhethu, Pitambar Sharma etc. Bhattarai is a seasoned politician and the ideologue of the violent Maoist insurgency. He hardly fits the generally accepted definition of “civil society member”. But currently his cohort is cashing on the Indian blockade to revive his political career in the guise of a new political force. Bhattarai resigned from his parliamentary seat immediately after the promulgation of constitution, showing neglect to the people of his constituency, who are among the worst hit earthquake victims. He was also one of the leading politicians involved in the drafting of Constitution. At other events, similar group of “civil society members” has gone so far as to say that Nepal is to be blamed for everything and India has imposed no blockade. This group includes the likes of Daman Nath Dhungana, Sundar Mani Dixit, CK Lal, Lokraj Baral. They were speaking at events organized by or in the presence of Indian Ambassador to Nepal, Mr. Ranjit Rae. Many in Nepal allege they work in tandem with the Indian bureaucracy and intelligence agencies to do a “narrative control” in Nepal. Perhaps, this is what observers meant while referring to the many “covert and overt” weapons India has at its disposal against Nepal ? The level of disrespect and interference in Nepal’s internal politics by India has gone so far that the blockade started with India demanding changes to Nepal’s newly drafted constitution. This headline from Indian Express just before the blockade began. While there is vehement denial of the blockade by Indian government, its operatives in Nepal and some of Nepal’s civil society members, enough evidence has been produced that show India is actively and directly forcing a blockade on Nepal. This is a picture of supply trucks queuing up at the Indian side of the border. Such queues stretch several kilometers and Indian security force selectively allow trucks to pass. Trucks carrying fuel are stopped on purpose. Indian journalist Anil Yadav produced a series of reports this month from a town near Nepal-India border. The performance of Nepal’s own government has been very lackadaisical. A weak coalition cobbled up after the blockade apparently against India’s wishes, shows no creativity or initiative to make things easier for the people. Government ministers and the Prime Minister are frustrating the ordinary people with their rhetoric full of lofty dreams but no matching action. In all this, the opposition party sees an opportunity to replace the government formed just months ago. The following cartoon published in a Nepali newspaper shows the Prime Minister busy talking, doing nothing.